This next week the new Absolutely Awesome South Africa will be available in book stores countrywide. The book promises to be as popular and as much fun as the original Awesome South Africa. This new volume serves to remind us of how great our country and its inhabitants really are. We also get to do what we do best, laugh at ourselves and our quirks, yet with pride in our hearts. Besides the history, geography, biology and heaps of general, interesting information, you will discover a plethora of humour and culture. The pages are littered with witticism, playful graphics and South Africanisms so familiar to us. To appreciate our long road to freedom this Heritage Day we have included a poem which appears in the book. Where all was peaceful beneath its sky. The Khoi and San gathered Rooibos tea. They painted and danced and life was good. No reason for them to be misunderstood. In the soil for all to see who was boss. Van Riebeeck arrived and grapes were planted. And the ownership of land was taken for granted. The indigenous folk were driven away. Malay slaves were bought and forced to obey. And aggravated the developing colour bar. With so many cultures, a new language was born. The Afrikaner nation was starting to form. To take the land was their only plan. And the Xhosa and Sotho fled for their freedom. The Boer trekked inland and established a state. But things started to change at an alarming rate. Gold was discovered and diamonds were found. The nation’s problems began to compound. And Ghandi resisted the ruling Caucasians. But the rights of the Black man were seriously breached. A dark time for all, the future foreboding. Segregation worsening, and hatred growing. The terms of apartheid were forced on the land. The ANC was formed and subsequently banned. The oppressed revolted and then were imprisoned. But the government was feeling increasingly threatened. There were rumblings of change, the people were scared. And allowed the Black man to cross the fences. Into a time of peace and celebration. That required full commitment from everyone. To learn love and respect in a way that was real. Poem © by Derryn Campbell. 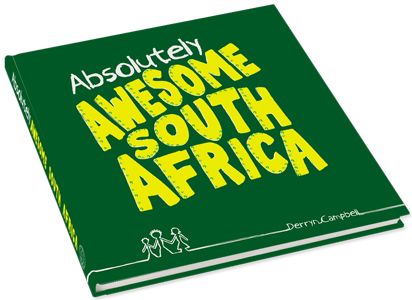 Click here to view pages of the Absolutely Awesome South Africa book. Please join us for a fun evening to celebrate the launch of Absolutely Awesome South Africa.